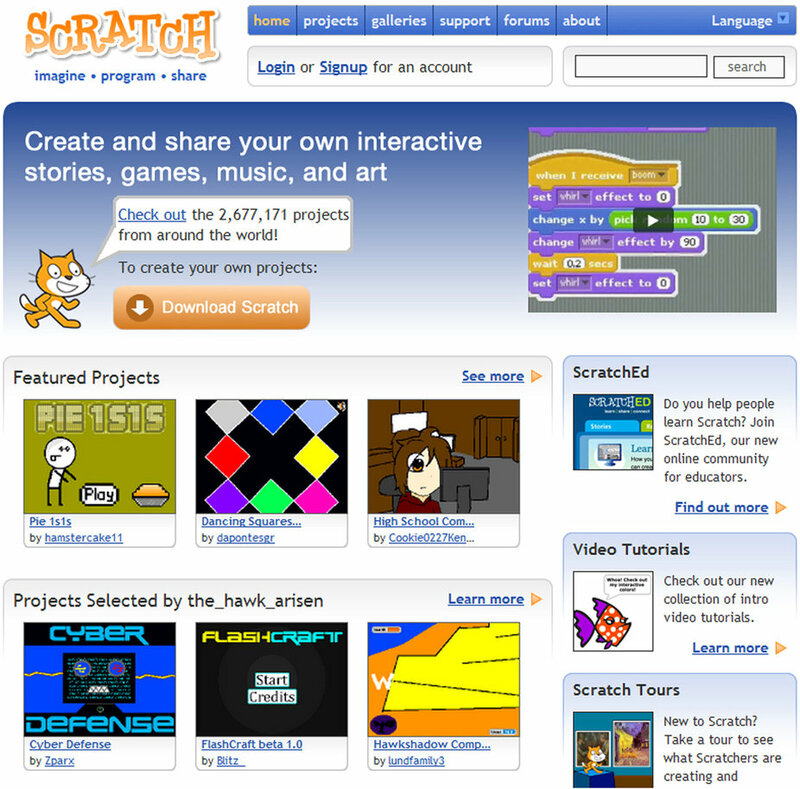 Scratch is a block-based programming language created by the Lifelong Kindergarten Group (LLK) at the MIT Media Lab. Scratch gives kids the power to use programming to create their own interactive animations and computer games. Since 2007, the online community that allows Scratch programmers to share, remix, and socialize around their projects has drawn more than 16 million users who have shared nearly 20 million projects and more than 100 million comments. It is one of the most popular ways for kids to learn programming and among the larger online communities for kids in general. Front page of the Scratch online community (https://scratch.mit.edu) during the period covered by the dataset. Since 2010, I have published a series of papers using quantitative data collected from the database behind the Scratch online community. As the source of data for many of my first quantitative and data scientific papers, it’s not a major exaggeration to say that I have built my academic career on the dataset. I was able to do this work because I happened to be doing my masters in a research group that shared a physical space (“The Cube”) with LLK and because I was friends with Andrés Monroy-Hernández, who started in my masters cohort at the Media Lab. A year or so after we met, Andrés conceived of the Scratch online community and created the first version for his masters thesis project. Because I was at MIT and because I knew the right people, I was able to get added to the IRB protocols and jump through the hoops necessary to get access to the database. Over the years, Andrés and I have heard over and over, in conversation and in reviews of our papers, that we were privileged to have access to such a rich dataset. More than three years ago, Andrés and I began trying to figure out how we might broaden this access. Andrés had the idea of taking advantage of the launch of Scratch 2.0 in 2013 to focus on trying to release the first five years of Scratch 1.x online community data (March 2007 through March 2012) — most of the period that the codebase he had written ran the site. After more work than I have put into any single research paper or project, Andrés and I have published a data descriptor in Nature’s new journal Scientific Data. This means that the data is now accessible to other researchers. The data includes five years of detailed longitudinal data organized in 32 tables with information drawn from more than 1 million Scratch users, nearly 2 million Scratch projects, more than 10 million comments, more than 30 million visits to Scratch projects, and much more. The dataset includes metadata on user behavior as well the full source code for every project. Alongside the data is the source code for all of the software that ran the website and that users used to create the projects as well as the code used to produce the dataset we’ve released. Releasing the dataset was a complicated process. First, we had navigate important ethical concerns about the the impact that a release of any data might have on Scratch’s users. Toward that end, we worked closely with the Scratch team and the the ethics board at MIT to design a protocol for the release that balanced these risks with the benefit of a release. The most important features of our approach in this regard is that the dataset we’re releasing is limited to only public data. Although the data is public, we understand that computational access to data is different in important ways to access via a browser or API. As a result, we’re requiring anybody interested in the data to tell us who they are and agree to a detailed usage agreement. The Scratch team will vet these applicants. Although we’re worried that this creates a barrier to access, we think this approach strikes a reasonable balance. Beyond the the social and ethical issues, creating the dataset was an enormous task. Andrés and I spent Sunday afternoons over much of the last three years going column-by-column through the MySQL database that ran Scratch. We looked through the source code and the version control system to figure out how the data was created. We spent an enormous amount of time trying to figure out which columns and rows were public. Most of our work went into creating detailed codebooks and documentation that we hope makes the process of using this data much easier for others (the data descriptor is just a brief overview of what’s available). Serializing some of the larger tables took days of computer time. In this process, we had a huge amount of help from many others including an enormous amount of time and support from Mitch Resnick, Natalie Rusk, Sayamindu Dasgupta, and Benjamin Berg at MIT as well as from many other on the Scratch Team. We also had an enormous amount of feedback from a group of a couple dozen researchers who tested the release as well as others who helped us work through through the technical, social, and ethical challenges. The National Science Foundation funded both my work on the project and the creation of Scratch itself. Because access to data has been limited, there has been less research on Scratch than the importance of the system warrants. We hope our work will change this. We can imagine studies using the dataset by scholars in communication, computer science, education, sociology, network science, and beyond. We’re hoping that by opening up this dataset to others, scholars with different interests, different questions, and in different fields can benefit in the way that Andrés and I have. I suspect that there are other careers waiting to be made with this dataset and I’m excited by the prospect of watching those careers develop. You can find out more about the dataset, and how to apply for access, by reading the data descriptor on Nature’s website. Thank you. While relatively small, the richness of relationships looks interesting. I’ve sent this to some students who work on community detection and related issues in temporal semantic graphs. Despite the fact that there’s an enormous amount of network data, there’s been almost zero network research on Scratch except a couple papers by Jeff Nickerson and students in his lab at Stevens (which are great but only scratch the surface of what is possible). I hope you and your students find this interesting and useful! Let myself or Andrés know if you have any questions.